Hello, again. As you all know, Halloween night is next Monday. This is an exercise to learn more about this scary festivity. Click on the picture, read and listen to the text and translate into Spanish all the underlined words. Write the translation in your notebook. Then, de the quizz I have given you, using the information you have in this Website. Good Luck! And, as usual, don´t forget to leave a comment on the blog about the activity and about Halloween. Hi! I'm Marta Broca. I think that the blog is very good. I like the Hallowen party. Hi!I´m Lucía. I like more this exercise because I learn some things, like Patricia and other people. Now I know more vocabulary in english, in the past questions I have only one error! this activity was very funny! 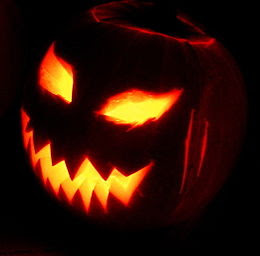 I like so much the exercise of Halloween because i love halloween and this exercise is very interesting and funny. The questions are very easy but i have had two mistake. The exercise is very fanny and some difficult but i´ve done. Now,I know a lot of vocabulary for halloween. In my neighborhood, the chilbren do "Trick or Treating" but I haven´t got candy. They make the "trick".In Monday, in the library, going to do something special. It´s a mystery. hi! i'm george and i think that the excersise is very interesting. Happy hallween!! Me encantan este tipo de iniciativas. Muchísimas gracias por este blog, la verdad es que entré en esta página buscando información sobre el día de acción de gracias, que me fuera tan completa como esta curiosa página que habla de thanksgiving Usa y me he encontrado un blog más que interesante. ¡Gracias!